Protesters held up signs as U.S. Senator Jeff Flake spoke with Randall Lane, chief content officer of Forbes Media. Around a dozen silent protestors stood up and held signs bearing the names of sexual assault survivors as Sen. Jeff Flake spoke at the Forbes Under 30 Summit at City Hall Plaza on Monday afternoon. The organizers of the protest aimed at Flake -- a key figure in the debate surrounding Judge Brett Kavanaugh’s Supreme Court nomination -- said they pulled the plan together just hours before the Arizona senator was scheduled to appear alongside a moderator at the event. Lynn Le, 29, of Portland, Oregon, and one of the organizers of the silent protest, said she thought it was important to galvanize the group at the high-profile conference. Le, who is a Forbes class of 2018 honoree, said if she didn’t take the opportunity to protest, “then what does that say to survivors” of sexual assault? She said the risk of being thrown out of the event was worth it. “We have an opportunity to have a say,” she added. Monday’s silent protest came just hours after demonstrators rallied outside of the Forbes event at City Hall Plaza to demand that Senators reject Kavanaugh’s bid for a seat on the Supreme Court. Le and several other protesters stood up as Flake sat on stage, answering questions about the state of the Republican party and how he felt after being confronted by sexual assault survivors last week ahead of the Senate Judiciary Committee’s vote to advance Kavanaugh’s nomination. 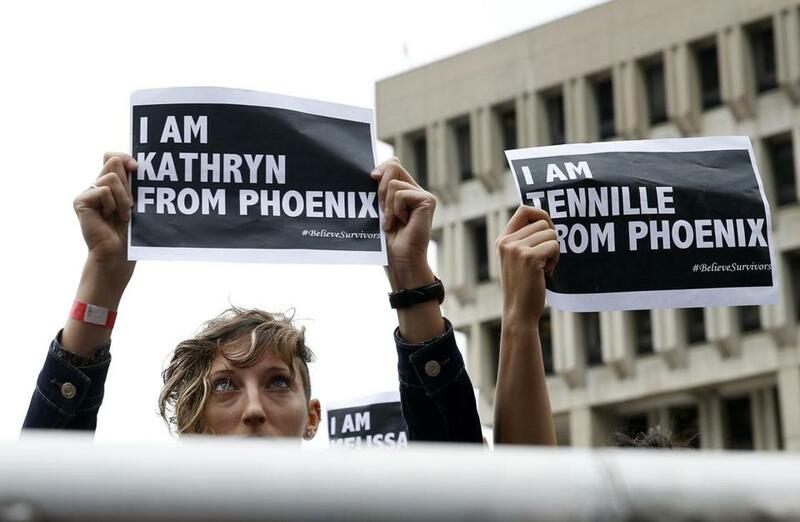 The black-and-white signs had the first names of sexual assault survivors from Flake’s home state of Arizona printed on them, as well as the cities where the victims are from. Le said there was a reason they remained silent as they held the signs up in the air, facing Flake. Aditi Juneja, of New York, said she decided to join the silent action because she felt an obligation to do something since she was at the event.